Oh Christmas tree! Thy leaves are so unchanging. This is my column as published last week in The Catholic Weekly. It’s taken a while but I think I have learned to embrace the mess that comes with having a brood of young children. Things that use to dismay me, like spilt milk at breakfast time, muddy footprints on just-mopped floors, and dirty socks stuffed into odd places, hardly register now. I clean up and I move on quite happily. God has helped me to grow up in this area at least. I only realised this after we put up and decorated our Christmas tree on the first day of Advent. 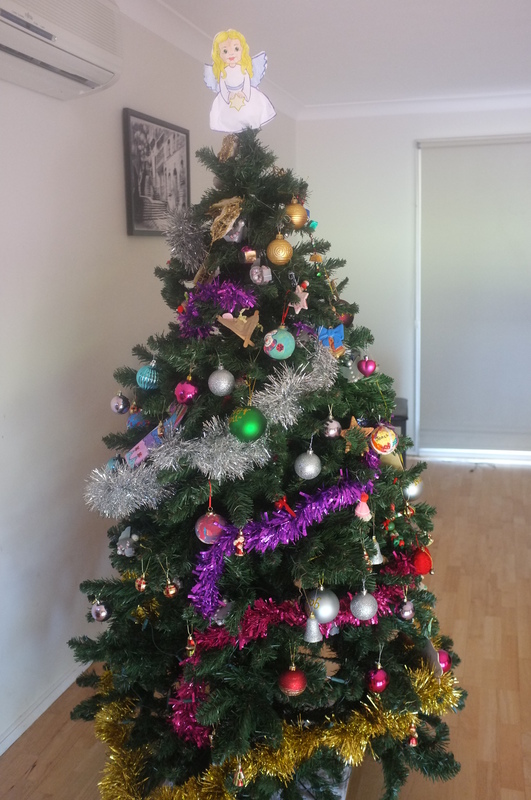 Naomi, our eldest, had suggested aiming for a baby blue, silver, and light pink colour scheme in the decorations this year. I was impressed, and immediately looked forward to having a tree that looked a bit more stylish than our usual slap-dash effort. I’ve always wanted a beautiful tree! We might ditch the tacky tinsel this time, I thought, and put on some other delicately spaced garlands or ribbons instead. A few fairy lights with clear bulbs would provide just the right amount of sparkle. And we’d just have to buy a large angel or star to adorn the top of the tree. So we gathered in the living room after dinner, with our tree and the plastic tubs of decorations Peter had hauled out of the shed. The tubs that we’d forgotten held all of the handmade decorations the children have made over the years, plus one I made much longer ago. They all had to go on! We’d forgotten the multi-coloured lights, and the children insisted they go on. Ditto with the different coloured strings of tinsel, in varying thickness. Most of our store-bought ornaments are random leftovers that survived last Christmas. There were the large baubles given to us by Nana and Grandpa, each one with a member’s name on it and 2011, the year they were given. Isaac doesn’t have one of them though, having been born since then. There was the one bauble with a photo in it of Jacob when he was a baby, another one with a toddler Joachim. There was new elf, and a reindeer made from a cork. Everyone attacked this tree all at once, sticking something on whatever bare branch they could reach. I used to enjoy having some creative control over our Christmas decorating when we had one and then two very young children. Now not only do I not have control over that and many other aspects of my life, I don’t even have the illusion that I have some control. I am reminded all the time in different ways of who is in really in charge here, and it isn’t me. If it were up to me, because I’m not naturally able to create something stylish, we would have had a very tasteful tree that would have been copied from the cover of a magazine. It would have been very pretty, but ultimately boring because I would only see a very superficial desire for beauty reflected in it, or the magazine I’d copied from. Instead we have a gloriously garish 6ft history of our family’s Christmases past, with a beautiful coloured-in and stapled-together paper angel stuck on the top. And a living room floor covered in glitter and shredded tinsel. The Christmas tree decorating drama is like a microcosm our life really. We got married, we made plans about what our life was going to look like, and the children came in and because of them everything got messy. But it’s mostly a really beautiful mess! Better than anything we could have imagined or accomplished by ourselves. One year I told my daughter (note, she’s an adult) that I wanted a tree with only heart ornaments on it. She reacted most violently! Apparently trees show history, and you can’t see history if you leave off all those ornaments 🙂 I did it one year though, when she was living in your city and we just had a small table top tree. I like your tree, very festive. We used to have one big tree and several smaller trees at my house. The smaller table top trees had different themes. Blue, borwn and gold and a toy tree. We had the toy tree in our bedroom. The big tree was the “messy” one. Maybe you could try compromising with stylish table top trees? Or have themes for other smaller trees? Oh Mary, thanks for your comment, I am such a thinking-inside-the-square person I never thought of more than one tree! 🙂 That’s a great idea.. We actually have several small conifers in a small courtyard outside our front door – I could decorate those how I like.